Can you Walk and Roll? Almost four years ago, two of my best friends welcomed to this world their second son. Now, where most of us parents have all the joys that motherhood (or fatherhood) bring in that miraculous moment you meet your new child, theirs was filled with uncertainty. Their son was born with the condition spina bifida. Basically, a portion of his spine never fully closed and his nerves were developing outside of his body. Before, Ciarlo (pronouned Char-loh...like the Italian word 'ciao') was a day old, he was whisked away to surgery where they proceeded to close the hole. This little man either lost, or never had feeling below his hips due to the damaged spinal cord. Without getting too detailed, Ciarlo's life has seen its fair share of surgeries and trips to CHOP (Children's Hospital of Philadelphia) with many overnight stays. Wow, so this season of American Idol was definitely different than years past. I don't know about you, but I've been watching the show since the first season when Kelly Clarkson and Justin Guarini went head to head. (minus about 3 seasons along the way) So for 10 of the thirteen seasons I've seen beginning to end. Though I've missed the original trio (Simon, Paula and Randy) the talent has always drawn me in and watching their journey is always fun. This year, though, I was super excited about the judges. They are all so talented and they are here, not just for our entertainment, but because they really care about the contestants. (the money doesn't hurt either) The banter and camaraderie among them was enjoyable to watch and they really seemed to have fun. In my opinion, these are the best judges Idol has seen. The talent this year though, was not as great as seasons past. And though I've liked Jena Irene and Alex Preston from the beginning, I didn't 'love' them. So, is anyone out there one of those people who loves to be freaked out? Have you ever watched something that makes you think about it for days afterwards? Yeah, when I saw the Blair Witch Project, that was me. Why do I do this to myself? I know I'm not the only one. How about you? Well, some of the Animal Planet's documentaries are completely like this. Have you ever watched any of them? Well, I hate to admit it, but several months ago, they totally 'got me' with their Mermaids: The Body Found. Seriously! Did any of you watch that? It was insanely convincing and I totally was sucked in to the episode! Until someone recently told me it was just entertainment, I was questioning whether they could be real. SMH...Okay, well Animal Planet has done it again. They've totally freaked me out with their new series this week. It ends on May 26 so you still have time to catch some of their latest shows. A different episode airs each night, sometimes two. One thing is for sure though, Animal Planet knows what they're doing with this stuff and they keep you glued to the t.v.. Tell me, are there any shows that you've loved on Animal Planet, or loved to hate? Anyone fooled by their well put together 'documentaries'? 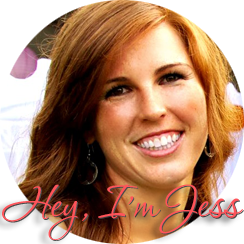 I'd love to hear from you...mostly so I don't feel so silly. Ha ha...Oh...and fyi...Shannon Doherty (anyone remember her?) yeah, she's in Blood Lake: Attack of the Killer Lampreys...any 90210 or Charmed fans out there? Okay, so....I know, I know...it's either feast or famine 'round these parts lately, huh? You have no idea how stressed I've been. This class I'm taking is killing me! Now, I'm doubling up classes so I can do my student teaching this fall so...just a heads up...it may get worse... That being said, I'm so excited to tell y'all about this great event that I went to with my mother in law and my sister in law. It's called Paint Nite! 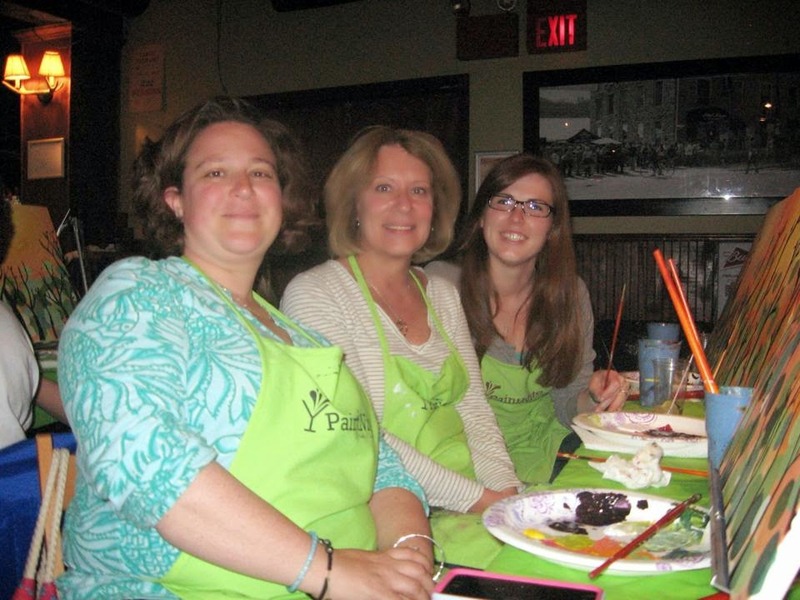 This group holds painting parties all around the Philadelphia area almost every night of the week. I saw their Groupon back when there was still snow on the ground...you know..two weeks ago...lol...only kidding. (So glad to have warm weather!) We got these tickets for about 40% off the regular price which is $45. Now all we had to do was pick a locale and a painting that we all agreed upon. We ended up in the Manayunk section of the city at Mad River Bar and Grill, the day after the river flooded. Other than the musty smell from flood, we had a great time! They had an artist and all of the supplies provided and set up for us. He went step by step how to create the painting but gave everyone the freedom to do whatever the heck you want. It was so much fun! I wasn't in love with the green on green dots, so I opted to add a little blue, just to change it a little more towards my tastes. Some other people went WAY off pattern and painted something completely different. We all walked away with a great experience AND a lovely painting to hang up. I can't wait to go again! I'm thinking a double date OR a mommy/daughter date. Either way, it'll make for another fun night! Interested? 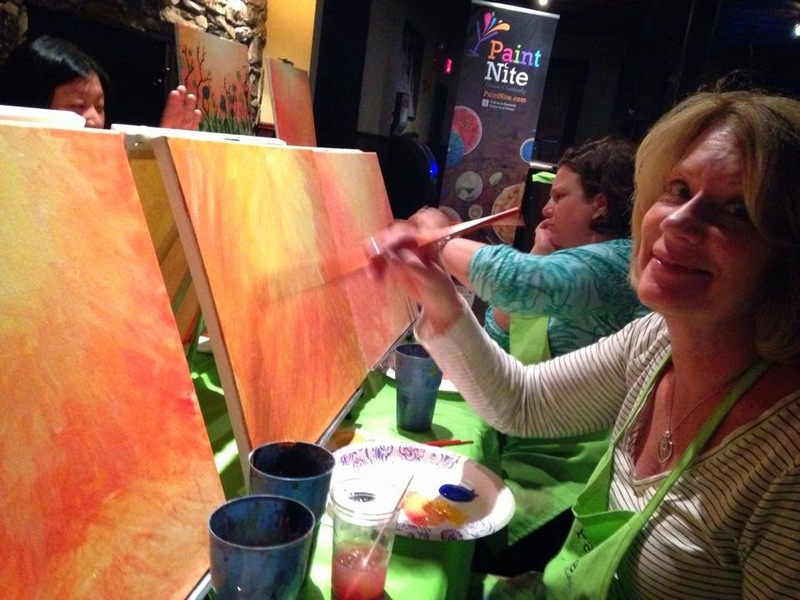 Just go to www.paintnite.com and register. 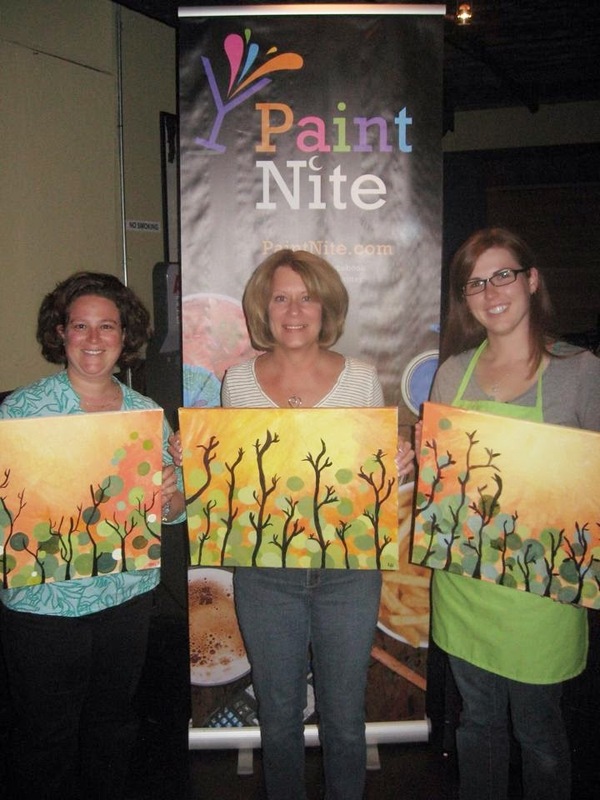 Disclaimer: I was not asked by PaintNite to promote their business nor compensated in any way. All opinions are my own.